i just made my first comment on a german psychiatrist’s blog! to celebrate this, i’m translating this joke here, which was one of his blog posts. back in december, the hospital hired three cannibals as janitors – john, frank and randy. it’s so difficult to get good help! on their first day, the human resource manager shook their hands and said, “welcome to the team! you’ll make good money, and the cafeteria has good food, so please, no need to get too interested in your co-workers.” that was fine with the three. four months later, they were asked to see the human resource manager again. “you’re all doing very good work, and i’m very satisfied with you. only one small thing: one of our nurses has gone missing. do you know what might have happened there?” the cannibals said no, no idea. This entry was posted in general and tagged germany, hospitals, jokes on June 4, 2010 by isabella mori. moss – green and soft and fluffy and in the forest. reminds me of the walk in the forest with r and c in germany, at that amazing source of water. what a wonderful experience that was – magic. magic magic magic. so green. so scrumptuously green. that was an amazing moment and i’d love to do it again. isn’t it funny how we want to repeat things that were special. are they really repeatable? i don’t know. hard to say. what am i saying – no, they’re not repeatable! at best, something slightly similar will happen. i don’t even remember the name of that place. i’m sure if i ask r and c they can tell me right away – it’s one of the places they are so proud of in franken. it’s amazing how much r loves his birth place. and i can see why. that was not the only magic place. all the rolling hills there in that old old old country. tiny villages that had been there since god knows when – 1200, some of them, i guess. tiny streets, cobbled. i remember that restaurant we went to with my aunt, it was so old, the ceiling was really low – because people weren’t that tall 400, 500 years ago! and the food was fabulous, real old fashioned german food. This entry was posted in creativity: poetry, art, etc. and tagged creative people, forest, franken, germany, moss, writing, writing prompts on June 14, 2009 by isabella mori. a picture of the “friedensengel”, or angel of peace, in munich, germany, just five minutes from my parents’ place. 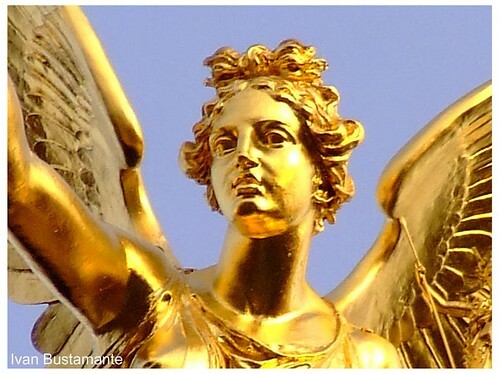 This entry was posted in peace, environment, social justice et al, wordless wednesday and tagged angel, bavaria, friedensengel, germany, munich, peace, wordless wednesday on May 13, 2009 by isabella mori.